What Is DA Form 1594? DA Form 1594, Daily Staff Journal or Duty Officer's Log is an official document issued by the U.S. Department of Defense that is used for recording the information on the daily activities of Active Duty service members. The recorded activities may include operational reviews, daily training, or counselling. This form was re-released by the Department of the Army (DA) in November 1962 and can now be filled digitally. An up-to-date fillable DA Form 1594 is available for download below or can be obtained through the Army Publishing Directorate website. The DA Form 1594 should not be confused with the DD Form 1594 (Contract Completion Statement) used by the Contract Administration Office (CAO) to track payments and the physical completion and closure of DoD contracts. PREVIOUS EDITION OF THIS FORM IS OBSOLETE. Instructions for DA Form 1594 are not distributed with the form. See Army Regulation 220-15 (Journals and Journal Files) released in December 1983 for additional information and related guidelines. The manual contains all policies, responsibilities, and procedures prescribed for preparing and maintaining journals and journal files. Fill in the top lines of the form. Indicate the number of the page, enter the name and location of the organization the journal is made for. State the period covered. The logs usually cover a 24-hour period, but that specific time period is not mandatory. Each entry should have a number, the time of the event and its specific details. Specify the actions taken in response to each and every event. All journal entries should be brief, clear and informative. Enter the final number of pages in the completed journal on the very top of the form. The complete log must be certified by the officer or official on duty. The appropriate boxes are at the bottom of the page. 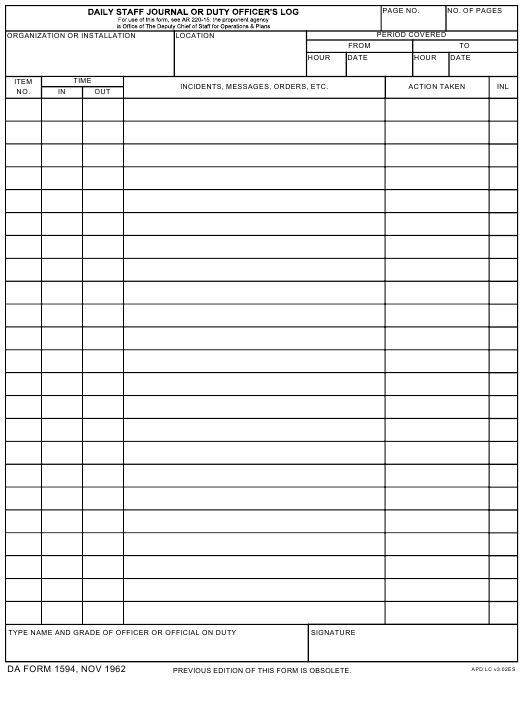 Additional copies of the form can be used as continuation sheets if a page lacks the needed space for the information. All logs should be safely stored for future reference.